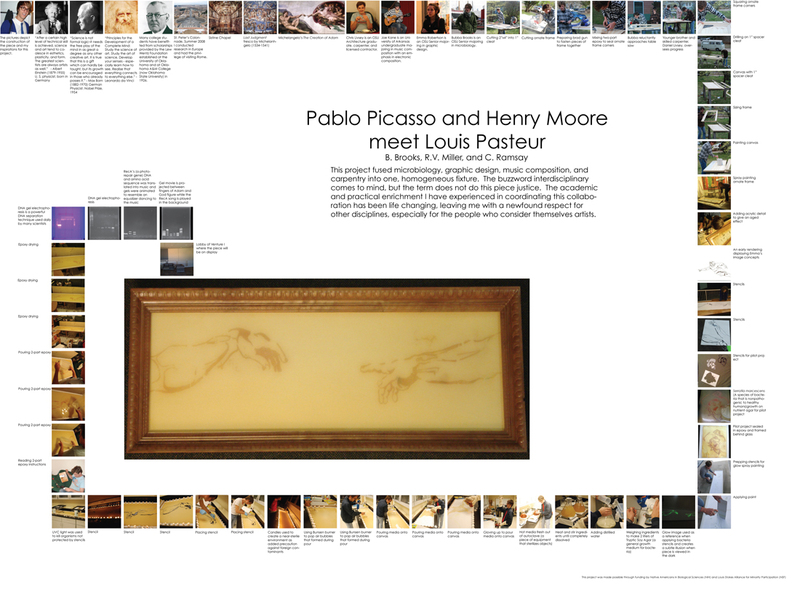 Pablo Picasso and Henry Moore meet Louis Pasteur was an interdisciplinary project between a graphic designer, an architect, a music composer, and a microbiologist. The project’s aim was to build bridges between disciplines fortifying the name Arts and Sciences not Arts or Sciences College. The project fused iconic art and science imagery by recreating Michelangelo’s The Creation of Adam using bacteria. This six foot wide bacterial painting set in a custom renaissance frame features an animated movie entitled GATACCA between the outstretched fingers of God and Adam. GATACCA depicts the DNA bands of a gel electrophoresis reaction dancing to music derived from the nucleic acid and amino acid sequence of the RecA photorepair gene. I was the lead researcher on this project, designing every detail. I conducted the grant writing, coordinated the carpentry work, and collaborated with an electronic media composer from the University of Arkansas to translate the RecA gene into music. I also learned how to animate movies using an Adobe software suite with the help of a graphic designer. This project was the epitome of interdisciplinary research and has left me better able to collaborate with experts from a wide range of fields. Pictured below is the poster I presented at the 2009 Wentz Spring Research Symposium at Oklahoma State University Stillwater, Oklahoma. The Wentz foundation allowed me the intellectual freedom, through funding, to conceptualize this piece from grant proposal to project completion. The poster was designed to give a “story-board” feel, with its winding snakelike path leading to the finished product.